This shop has been compensated by Collective Bias, Inc. and its advertiser. All opinions are mine alone. 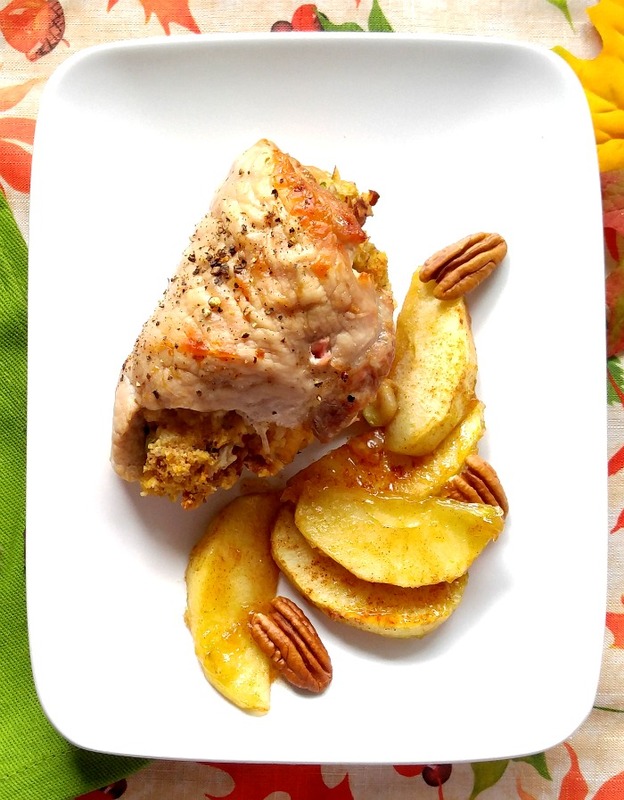 #SmithfieldCares #CollectiveBias It’s time for some apple pecan stuffed pork chops! 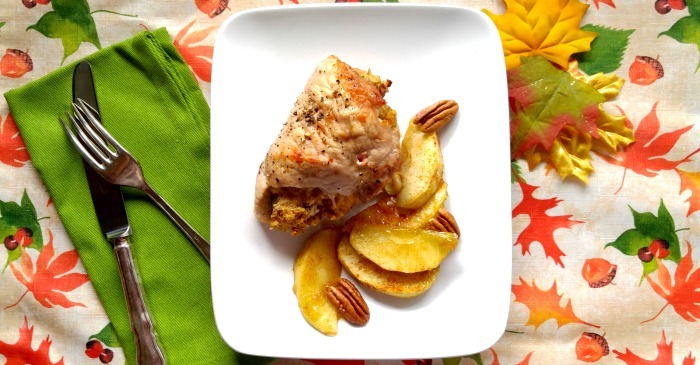 Apple Pecan Stuffed Pork Chops bring the flavors of fall to your table. Apples and pecans are two of my favorite tastes for recipes in autumn. I know how well these natural flavors will compliment the Smithfield All Natural Boneless Pork Chops for our dinner tonight. Smithfield all natural pork is naturally tender and juicy. I love to cook with it, because it is made without steroids, hormones or artificial ingredients. This all natural pork is high quality, and very easy to prepare. It is versatile enough for easy weeknight cooking and also perfect for special occasions. I also love that Smithfield is community focused, as well, so I use their products often. Right now, Smithfield and Walmart have a ‘Compassion for Community’ mission going on which focuses on heroes in our lives. The hero in my life is my husband, Richard. He is such a good friend to me, and helps me in more ways than I can count on an everyday basis. He may not be a hero in the normal meaning of the word, but he is a big hero to me! Richard personifies the three traits that this mission is looking for: Compassion, Care and Commitment. 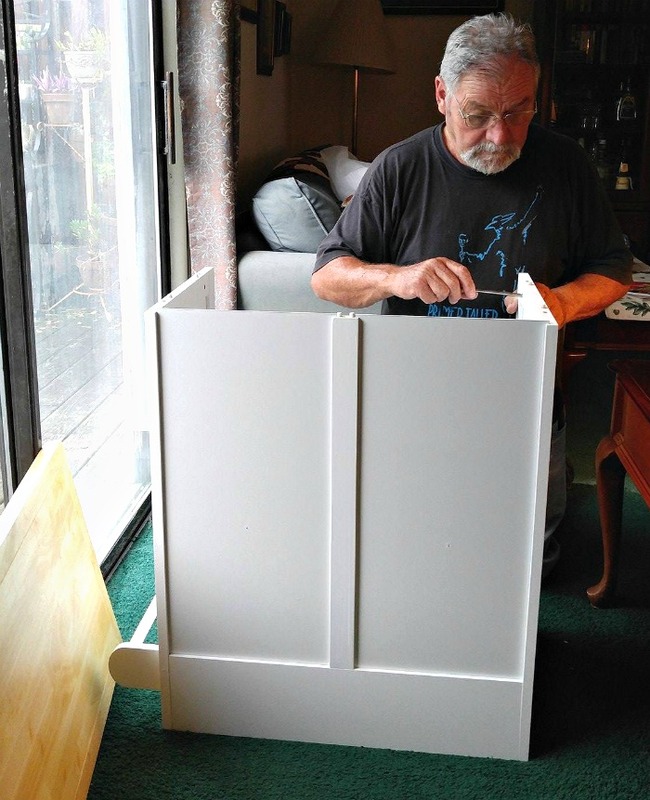 Right now, my hero is putting together a small movable island for my kitchen so that I have more room to work when I am cooking my blog recipes. I have a tiny kitchen, and this is going to be such a help in my life. I can’t wait to start using it! Do you have a hero in your life? Why not nominate that person in the #SmithfieldCares Sweepstakes? With over $9,000 in prizes, don’t miss your chance to nominate someone in your community or life who deserves special recognition for embracing compassion, care and commitment. Smithfield will award prizes to local heroes. 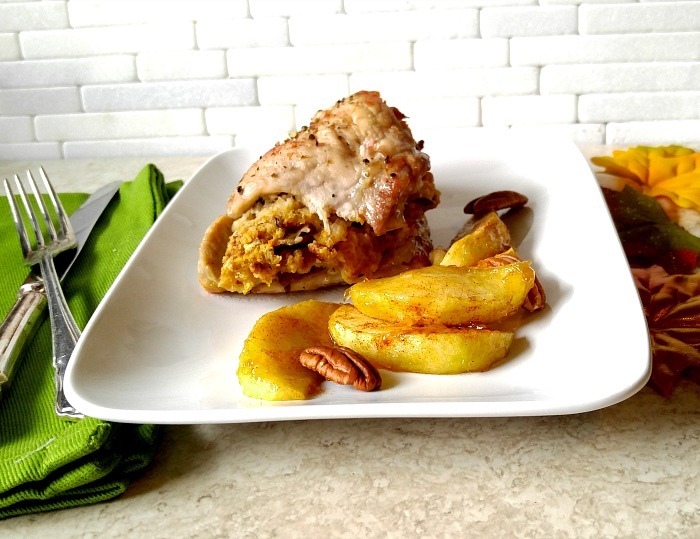 This Apple Pecan Stuffed Pork Chops recipe is so unbelievably flavorful. 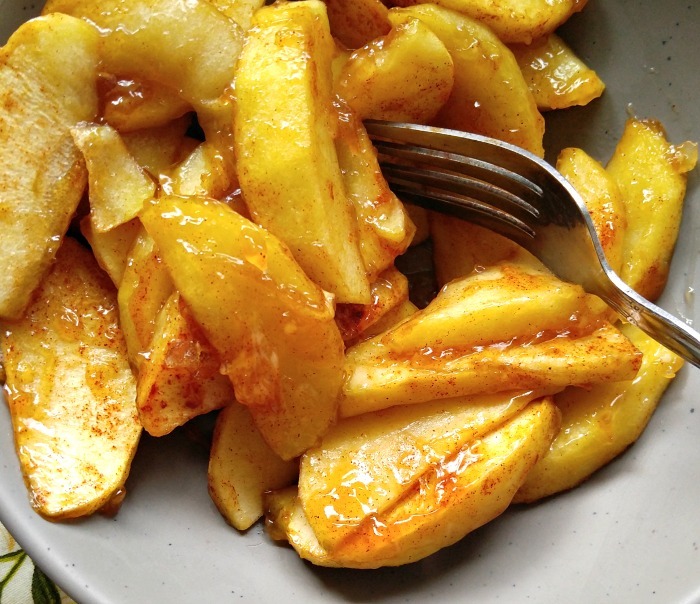 I love to serve it with some baked cinnamon seasoned apple slices to really pull the meal together in a comfort foodie fall way. Fall is a busy time of the year for me. There seems to be so much going on during the week. Having a meal like this that comes together in 30 minutes means that I can enjoy the fun things going on instead of spending a lot of time in the kitchen. But don’t let the ease of making this dish fool you. It is also perfect for a weekend meal when you have friends over the the evening! Look at all those luscious fall ingredients! I can’t wait to combine them all and sample the dish. I just know my hero is going to love it! The stuffing is a cinch to make. I used a packaged cornbread stuffing mix and just added some butter and vegetable broth. It doesn’t even need cooking. Just boil the water and butter and add the stuffing mix! While the water boiled, I chopped my apples and celery. 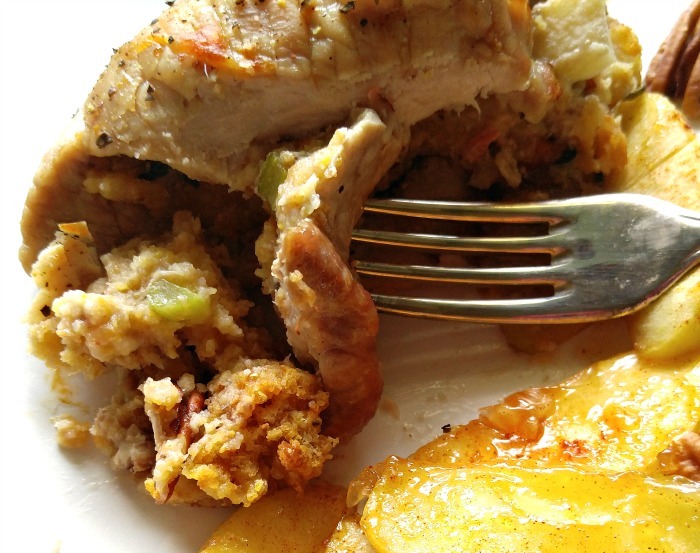 And the flavor of these Apple Pecan Stuffed Pork Chops? TO DIE FOR!! The stuffing is crunchy from the celery and pecans and has the sweetness from the apples. The flavors compliment the Smithfield All Natural Boneless Pork Chops beautifully. I even had time to do some seasoned baked apple slices to go along with the meal. I just put my pork in for 10 minutes and added the apples for the last 15 minutes. PERFECTO! 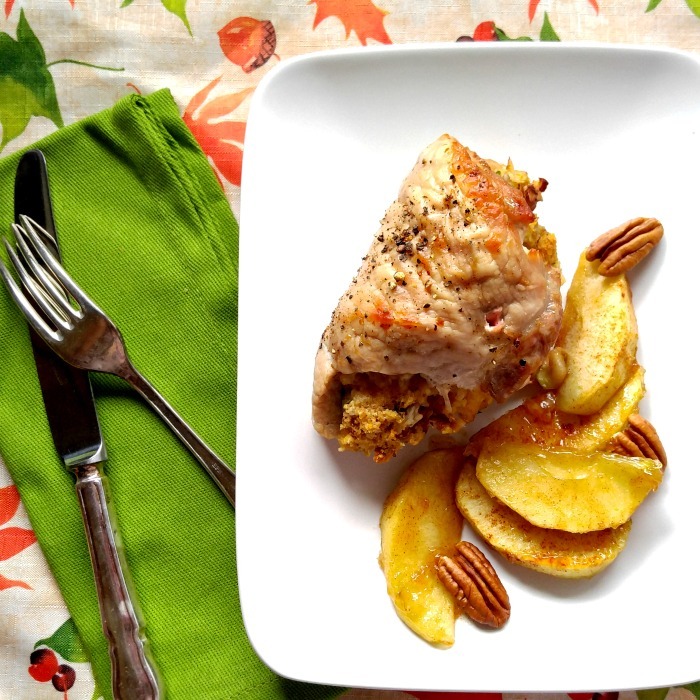 One bite of these Apple Pecan Stuffed Pork Chops and you will know that your hero is going to be pleased as punch. I guarantee you that he will be asking you to make it again soon! 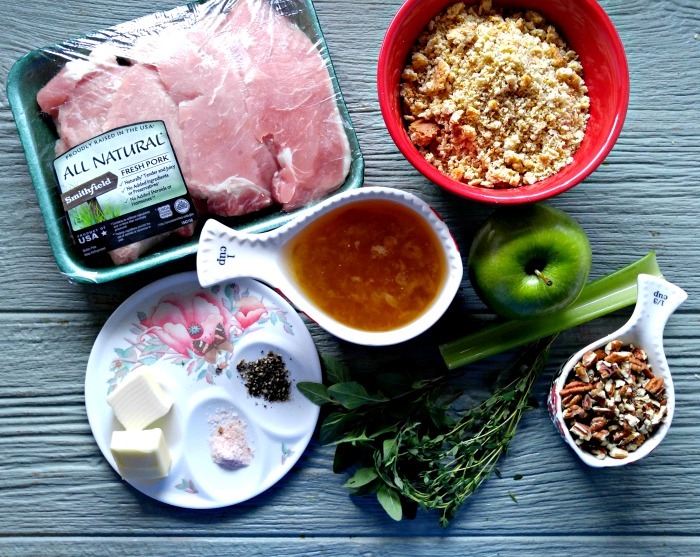 Ready to make this Apple Pecan Stuffed Pork recipe? 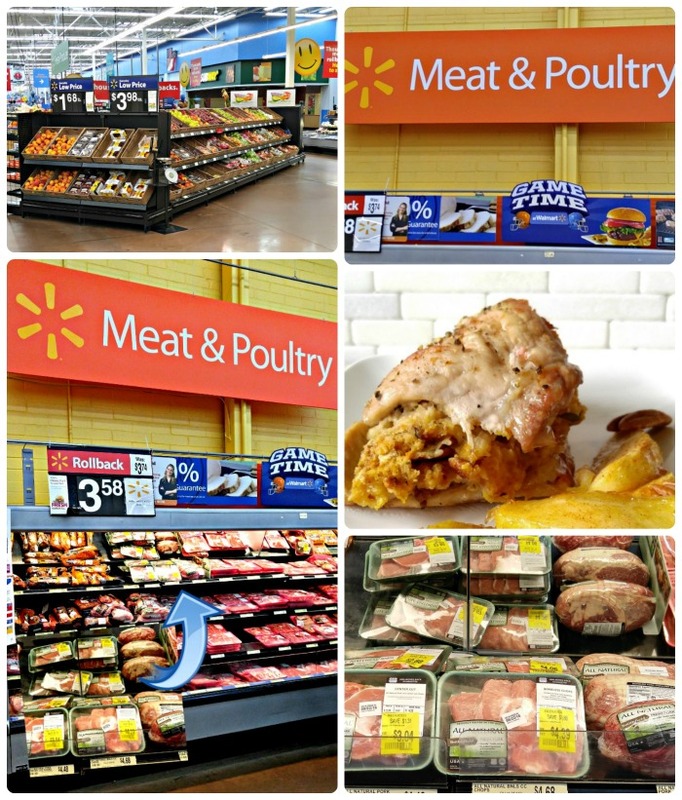 Head to your local Walmart and visit the fresh meat section for your Smithfield All Natural Bone-in Pork Chops, and then round up the other items in the produce aisle. As an added bonus, Ibotta has a special offer: You can save $1.00 on any Smithfield All Natural Pork variety (while supplies last). My recipe made more stuffing than I needed for my pork, but never fear…It also makes a great side dish for another meal. After all…it’s fall and stuffing is always on the menu! Don’t forget to use the Ibotta offer below. It will give you an extra savings on your Smithfield All Natural Fresh Pork Product on your next shopping trip. If you would like to make this recipe for your family, head on over to Walmart and visit the fresh meat aisle and then visit their well stocked produce area. I found my Smithfield All Natural Fresh Boneless Pork Chops on the top row of the pork section in the meat and poultry area of Walmart. Ready to nominate your hero for the “Compassion for Community” mission? Just use the form below. #SmithfieldCaresSweepstakesFor more great recipe ideas, be sure to visit the social hub. 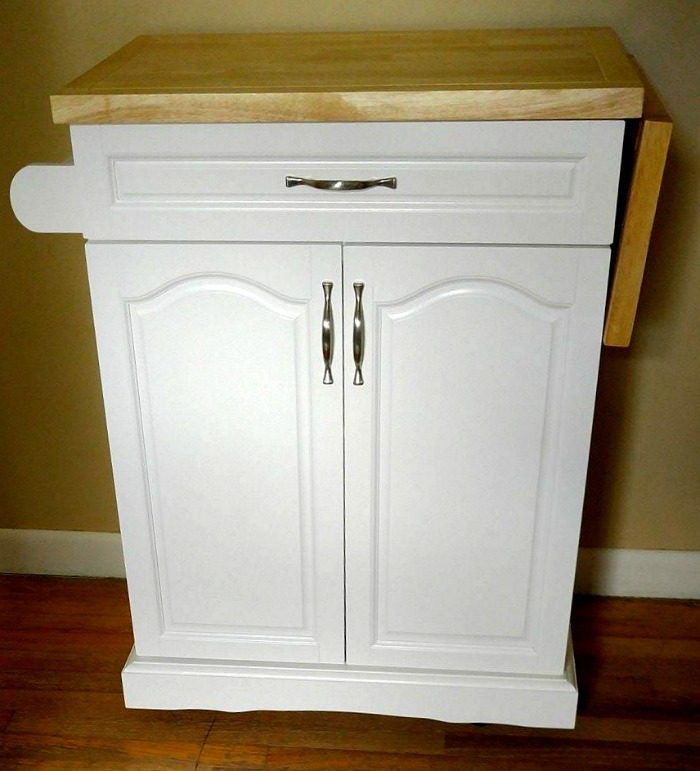 By the way, here is the finished kitchen island that my hero husband put together for me today. I can’t wait to put it to use! Looking for some more inspiration? Check out this YouTube Video! Boil the water and butter and then add the cornbread stuffing. 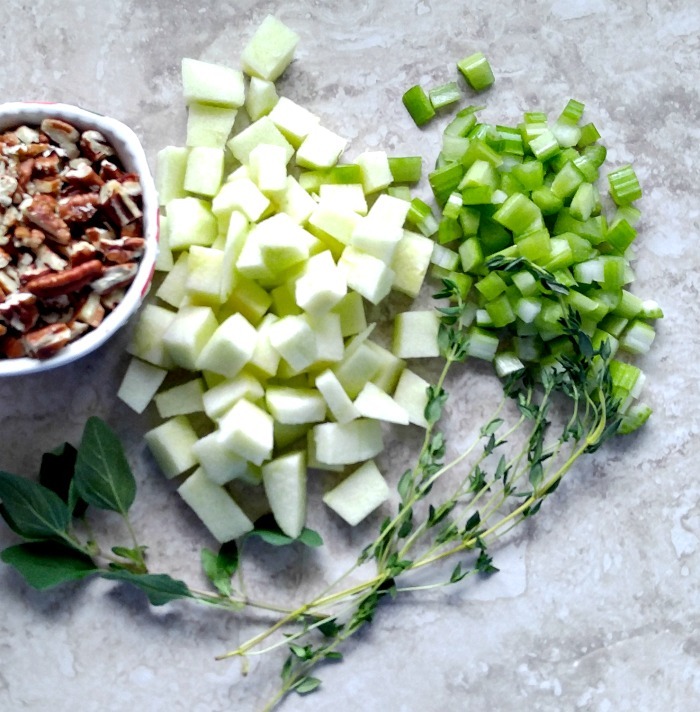 While the water is boiling, dice the apples, pecans and celery. 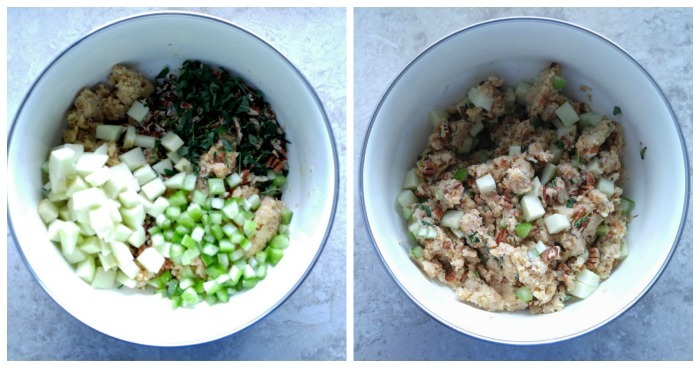 Place the cornbread stuffing mix in a bowl and add the minced fresh herbs and chopped apples, pecans and celery. Stir in the mixture and combine well. Place the Smithfield All Natural Boneless Pork Chops under a baggie and use a meat tenderizer to pound to 1/2" thick. Add some of the cornbread stuffing mix to one half, fold over and secure with a toothpick. Place on a baking sheet lined with parchment paper and season the outside of the pork with sea salt and cracked black pepper and place in the preheated oven for approximately 25 minutes until the pork reaches an internal temperature of 145 degrees. Let the meat rest for about 3 minutes. NOTE: If you love your pork medium rare, you should cook it to an internal temperature of 145 degrees (followed by a three-minute rest). If you like your pork a little more done, you can cook them to an internal temperature of 160 degrees. To make the apples, place them in a baking dish, and add the water and cornstarch mixture. Stir in the brown sugar and sprinkle with cinnamon. Cook during the last 14 minutes in the oven with the stuffed pork chops. ← Chocolate Chip Oatmeal Bars – Cookies and Bars in One Dessert!